I really enjoyed the room and everything that was included. For example, the suplies provided to us and the comfort it brought to my aprtner and I. If you are looking to stay at the financial district, be able to work in your hotel room and have a decent room size, this is a great choice! The hotel is your little apartment in NY and perfect for short or longer stays. Functional, internet works great, bed is comfortable, TV offers the Netflix option, offers a strong shower and bedrooms are quiet. Everything was great. From the moment you walk in to the hotel, you feel the hospital. It smells amazing. No matter how many times you walk passed the concierge desk, the greet you as if it’s the first time they’ve seen you. Having everything you need to cook & serve dinner was also a plus. New rooms, minimalist and very clean. Great kitchen and equipment was clean and in order. Nice location in lower Manhattan. Very helpful staff. Everything about the property was five star quality. The staff was super warm, pleasant and helpful/acommodating at all times. good location and nice room. Staffs are friendly and helpful. Excellent! Very clean, staff friendly, good location! The rooms were cute and clean. Loved the bathroom and shower. The staff was very helpful and accommodating. Extremely friendly and helpful staff. The rooms were well appointed and extremely clean. The location in the financial district was great for walking to to many sites. Had Thanksgiving dinner at the Federal House and it was in the same building. 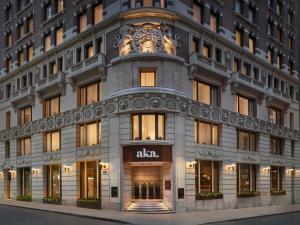 Lock in a great price for AKA Wall Street – rated 9.3 by recent guests! AKA Wall Street This rating is a reflection of how the property compares to the industry standard when it comes to price, facilities and services available. It's based on a self-evaluation by the property. Use this rating to help choose your stay! AKA Wall Street is 3,150 feet from the One World Trade Center and the Brookfield Place. South Street Seaport is 1,600 feet from AKA Central Park. Guests at AKA Wall Street will also find several shopping and dining options within 0.6 mi from the property like Zara, Open Kitchen, Chipotle, Morton’s Steak House and more. The suites at AKA Wall Street come with a kitchen that is equipped with stainless steel appliances. All rooms have attached marble bathrooms with Bulgari amenities. Flat-screen TVs are also provided. AKA Wall Street also has complimentary WiFi, a business center with an executive conference room and a Technogym fitness center. Personal training options are available as well. Guests will also enjoy access to the indoor/outdoor rooftop terrace lounge which includes a private cinema and offers city views. The New York Stock Exchange is 1,600 feet away and The Brooklyn Bridge is 0.7 mi from the AKA. Wall Street - Financial District is a great choice for travelers interested in skyline views, atmosphere and city walks. When would you like to stay at AKA Wall Street? This studio features a full kitchen. This studio has a sofa, stovetop and kitchenette. This suite features air conditioning, kitchenette and sofa. This suite features air conditioning, dining area and seating area. This suite has a cable TV, private entrance and view. This double room features a dishwasher, private entrance and tea/coffee maker. This double room has a dishwasher, tea/coffee maker and air conditioning. Anchoring an elegant corner in the heart of New York City's exciting Financial District, newly opened AKA Wall Street features 132 sophisticated suites and outstanding residential amenities perfect for short and long term stays. Each suite includes custom-designed furnishings, gourmet kitchens, and spa-like baths with amenities from Bulgari. 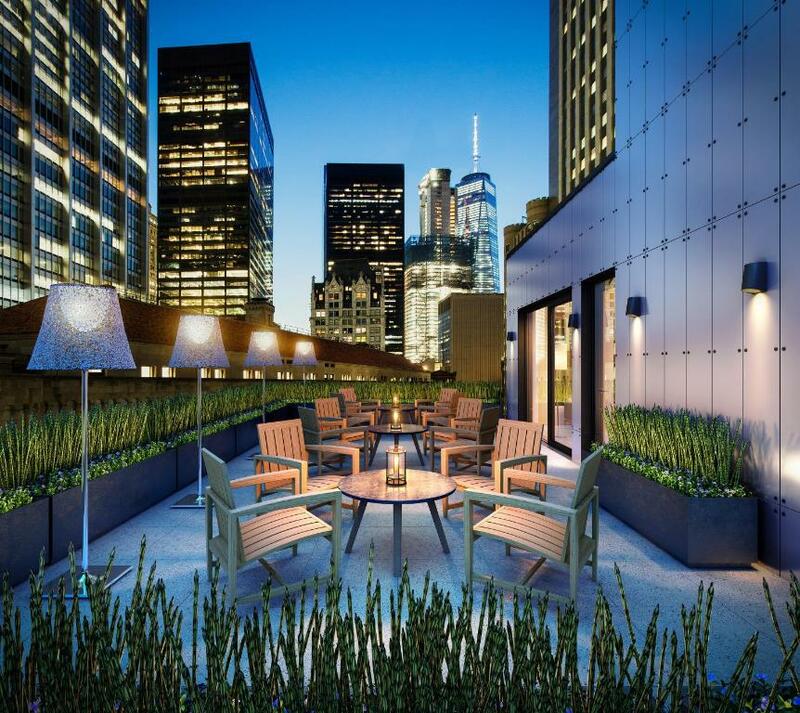 Amenities and services include a four seasons rooftop lounge with indoor/outdoor private cinemas, Technogym fitness center, complimentary wifi, business center, executive boardroom, and a gracious 24/7 Resident Services Team. Area Info – This neighborhood is a great choice for travelers interested in skyline views, atmosphere and city walks – Check location Excellent location – show map Guests loved walking around the neighborhood! House Rules AKA Wall Street takes special requests – add in the next step! AKA Wall Street accepts these cards and reserves the right to temporarily hold an amount prior to arrival. Housekeeping service is provided once per week for stays of 5 nights or more. Additional housekeeping services are available for an additional fee. Please note that alternate terms and conditions may apply for reservations over 28 nights/days. The property will get in touch with you with a contract that will require your signature to confirm reservation. Please note, an extra bed is available for the two bedroom suite for an additional fee. Kitchen needs instructions for dishwasher and oven. Service was consistently great. The best. Rooms optimal design and size at 67sqm! Rooftop lounge and patio so cozy and comfy. Great breakfast partner Blue Ribbon at the gf. Perfect location central to all. Polite and helpful stuff, very clean room and amenities. A big nice room where you could feel at home and the size of the shower was amazing. Location was perfect and with Tim’s little corner cafe, Blue Spoon Coffee, a lovely breakfast was easily serve from a place with great personality. Location is in the heart of wall street, so close to the subway lines and Occulus terminal for shops and restaurants. Not a major gripe but the complimentary coffee on the rooftop was every bit as poor as I’d read. It’s great they offer it but even mediocre would be better than poor. Impeccably clean and spacious, our superior studio was a welcome retreat after a long days out and about. The furniture, linens and bathroom facilities were all quality and the bed & shower were excellent. We only had one visit from housekeeping during our 5 night stay but this was perfectly adequate and we preferred the lack of interruption. There’s lots of storage in the studio so it stayed tidy and clean and the front desk are happy to replenish soaps/towels etc as needed. So happy we booked here instead of a small hotel room midtown, it really made our trip having such a great base. Downtown is safe and clean and a short walk to many of the places we wanted to go - WTC, Staten Island ferry, Brooklyn Bridge and a quick subway ride mid/uptown. Lots of good places to eat - we liked The Hole in the Wall, Cliff St & Open Kitchen for breakfast and Fraunces Tavern for dinner. Great new little gin bar called Lovelace down at South Ferry with live Jazz. Staff at AKA were very welcoming and helpful and it was fantastic to have complimentary and high speed laundry services onsite which meant we could travel light. I would have no hesitation at all recommending AKA Wall St to friends and family or colleagues traveling to NYC on business. Thanks for everything!!! Aka Wall Street is a very convenient hotel in the heart of the financial district in NY. Check-in was quick and efficient with a great welcome smile. The room is spacious and trendy. I didn't use the kitchen but it's a functional (and modern) one. The bed is very comfortable with easy outlets for you to charge your devices. I really liked the experience and will come back when I have a chance. Great experience. Great staff. Great hospitality.